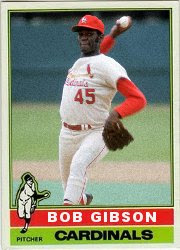 Well, it's been awhile since I spotlighted a pitcher, so who best to follow up Mr. October than another intimidator from the 60s and 70s than Bob Gibson. I do not know much about Gibby, as he retired the year I was born, but I do know he was a strikeout machine in Sports Illustrated Superstar Baseball. As mentioned in a previous post, I watched an interview with Gibson and Reggie Jackson on PBS a few weeks back. Even at the age of 74, Gibson is still incredibly intimidating. He also looked like he had the fire to go out and pitch a few innings. During the interview, he recounted an incident he had with his battery mate, Tim McCarver during a mound conference. I do not recall the exact conversation, but McCarver was trying to give Gibby some advice and Gibson's retort was "The only thing you know about pitching is you can't hit it." Love it. Also, there was an "incident" during the 1993 Old Timers Game between Jackson and Gibson. The story goes: "In 1992, an Old-Timers' game was played at Jack Murhpy Stadium in San Diego as part of the All Star Game festivities, and Reggie Jackson hit a home run off Gibson. When the Old-Timers' Day game was played in 1993, the 57-year-old Gibson threw the 47-year-old Jackson a brushback pitch. The pitch was not especially fast and did not hit Jackson, but the message was delivered, and Jackson did not get a hit." That incident makes the PBS interview that much more special. Anyways, Gibby or Hoot was only the second pitcher to record 3,000 strikeouts at the time. Cool! Also, I just read he was born Pack Gibson after his father, and changed his name to Robert when he was 18. If I haven't mentioned it already, this is a great series of cards and I'm looking forward to more. Superstar Baseball was my introduction to tabletop gaming. I learned a lot about the old timers by playing that game. These cards are cool.